Project: CSO funded research project (RCT) based in Glasgow, Scotland. Target group: Primary care based patients aged 18+ recruited by GPs or other primary care based staff. Settings: Patients aged 18 years and over who presented to one of seven GP practices in Glasgow, Scotland with symptoms of depression, scored via Beck’s Depression Inventory (BDI) were offered entry into this study. Intervention: The patients who consented were randomly allocated to receive treatment as usual (TAU) or guided CBT based self-help (GSH-CBT) using the Overcoming Depression and Low Mood book, with three support sessions averaging 40 minutes. 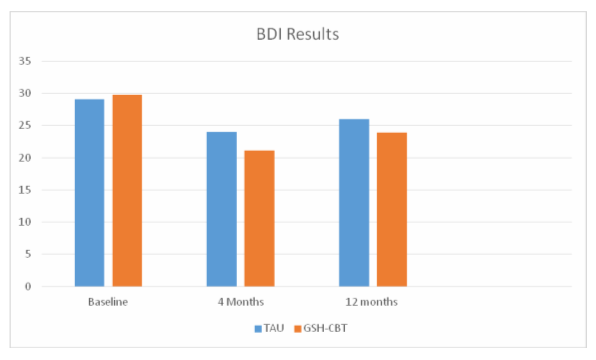 Outcomes: The Beck Depression Inventory–II was used to measure symptoms of depression at the start (baseline), 4 and 6 months after treatment for TAU verses GSH-CBT. GSH-CBT was substantially more effective than TAU. Training in the use of the same book is available within the SPIRIT training course.